Sarah Bernhardt (1844-1923) French actress who made her American debut at Booth’s Theatre in 1880. The New York Times index of theater reviews include a number of plays in October- December 1891 and Theodora Jan 5 1892. She was in the audience when Alabama was produced at Palmer's Theatre in 1891. Did EJ Phillips see her act? Seems almost certain that Maud Harrison did. Enclosed I send you a recipe to make "sedative water" for sponging the body over after a bath. It prevents taking colds and (as the ingredients tell you) is very strengthening. I tried it last night for the first time, slept like the proverbial "top" and feel almost free from the pains in my joints and limbs this Morning. For [grandson] Edward I would take half a teacup full of hot water and add a tablespoon full of the mixture. Rub him all over and wipe him dry with a towel very briskly. I think it would also be very good for you – strengthen the muscles and keep the cold out and give you an appetite. Try it - and for [Neppie's husband, EJP's son] Albert after a drill or fire. He will likely need it after performance on the 22nd. Miss [Maud] Harrison obtained the recipe from Sarah Bernhardt and she tells me she has been using it for sometime and has never had a cold since using it, though very subject to them before, as I know. I expect to grow quite young under its influence, judging by my feelings this morning after one application. I think this might be good for Edward – a tablespoonful will be enough to use at a time, or even less for him. Do not put it on his face. He might not like it, though it would not impair him. 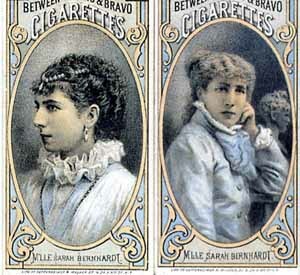 Sarah Bernhardt toured America 9 times. Except on rare occasions, in later years, she always performed in French. Her celebrated roles included Frou-Frou and La Tosca. EJ Phillips' colleague Jessie Millward asked Sarah Bernhardt why she had never learned English, and reported on her stage roles. through an interpreter, and she reminded me of many of the parts I had played at the Lyceum. Then she said that she had heard that I was to play in " Diplomacy," and asked what part I had selected. I told her that I had chosen the part of Zicka.
" Wise girl," she said, nodding her head ; " that is the part." And then I summoned up courage and asked her why she, who could do nearly everything, and had such multitudes of admirers in England and America, had never learnt English. She laughed. " Madame has never had the time," explained the interpreter.
" Pull eet ! " she exclaimed. " Is eet real or not ? " And then, taking his finger, she bit it.
" Are zey false ? " she demanded. he had penetrated the great tragedienne's hotel sitting-room to make enquiries as to her future arrangements, and had asked, among other things, whether she intended visiting all the States. "Boston, Chicago, Philadelphia, St. Louis, Baltimore, Minneapolis, sure — but nix on the punk towns," was the reply that the divine Sarah was reported to have given.